We hear your little one is known to disappear for hours at a time. That you often find him standing motionless against a wall, on a reconnaissance mission, or hiding in a corner with a potted plant on his head, hoping to look like your heirloom end table. We feel for you. 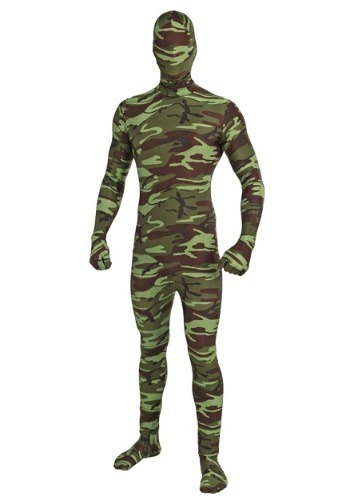 Which is why we’re suggesting this Child Camo Second Skin for your little Houdini. Now, he can blend in seamlessly with the world around him...and outdoors, to boot! No more tripping over him in the entryway or being scared half to death when he emerges from behind a curtain. And now that he’ll be busy hiding around in the bushes, he can’t just be dressed in a pair of blue jeans and a bright red t-shirt, now can he? Camouflage is the only real option for stealth operations in the woods. If your child wants to blend in (and we know your child does) he'll be able to go completely undetected in this sleek suit. We're just hoping he’s coming back for dinner, because you sure won't be able to find him out there. That’s because this jumpsuit is printed in classic camo, as are the attached gloves, socks, and mask. So go ahead, ask him if he’d like to own the ultimate gear for outdoor covert ops...we’ll wait while you try and find him.